Boston Red Sox World Champions - Champions - World Series Winners!!! The Boston Red Sox . . . World Series Champions!!! The Sox clinched the World Series against the St. Louis Cardinals in Game 6 - the first time the Red Sox have won right here in Fenway Park since 1918. From the moment the Dropkick Murphys performed the National Anthem to the last choruses of "Three Little Birdies" by the exhuberant crowd after the triumpherant conclusion and fireworks, this was a game and a season to remember. With their lucky red beards, the Red Sox went from being the worst team in the league to World Champions, with David Ortiz named as World Series Most Valuable Player, plus memorable performances by Jon Lester, closer Koji Uehara, John Lackey, Dustin Pedroia, Shane Victorino, Stephen Drew, Mike Napoli, and the rest of the team. John Farrell also proved to be a great choice for manager. Don't miss the huge rolling duck boat World Series Victory Parade in Boston on November 1st! NOTE - Parking bans are in effect throughout much of Fenway from 4pm to 2am - and also around TD Garden. Lots of street closures will also be in effect, or take effect from the 6th inning on, and the area around Fenway Park will also be blocked to pedestrians from that point forward. The T will remain open and running until everyone is out of Fenway Park after the game. These ticket resellers consistently offer a wide selection of seat choices and standing room only tickets at competitive prices. They keep their prices competitive by keeping their fees amongst the lowest in the industry. These are the resellers we go to when we need tickets ourselves. And, they stand behind their tickets. If the game is canceled with no reschedule date - for example, if you buy tickets to Game 7 on October 31 but the Red Sox sweep the Series after Game 4 causing Games 5, 6, and 7 to be canceled (yes, we're hoping this happens), you get 100% of your money back. Also, they guarantee your tickets will arrive in time for the game, will be the exact tickets you ordered or comparable alternatives, and will be legitimate and valid for entry. To back this up, they offer 125%-200% money back guarantees. World Series tickets always cost a lot - so make sure you buy from a legitimate source. Don't get scammed by scalpers. If you want to go to one of the World Series games, get your tickets now - prices only go up closer to the event, not down. Are you coming from out of town for the game? Or planning to party at the nearby bars and nightspots, and no one's volunteering to be the designated (sober) driver? Hotel Commonwealth - Also an easy walk from Fenway Park - only slightly further than the Buckminster. Rates will be high at this luxury boutique hotel, but look at it this way - your room will still probably cost less than your tickets! Want to avoid high Boston city hotel prices? Check out our recommendations for inexpensive hotels in Boston, including suburban hotels within easy reach of the city and Fenway Park. October is a busy month for Boston hotels, with lots of tourists as well as business conferences. Don't wait to make your reservations! 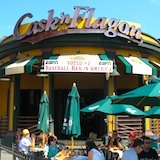 You'll find celebrations going on in all the legendary sports bars near Fenway Park before and after the World Series games. 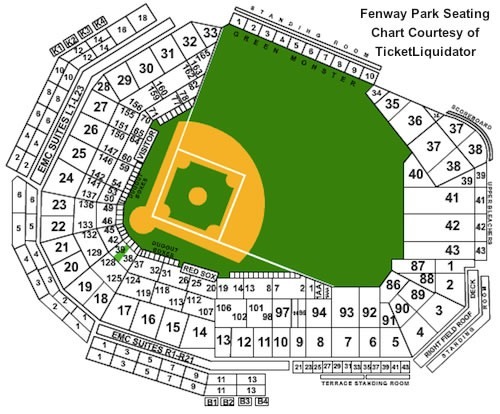 No luck with tickets to watch the Red Sox play in Fenway Park? Remember, all the sports bars boast big and bigger screens - so you'll catch plenty of action even if you're not quite in Fenway Park in person. The easiest and sanest way to get to Fenway Park is by T (Boston's Subway). Take the Green Line-B to Kenmore Square. Walk 2 blocks to Fenway Park. You won't get lost - just follow the excited crowd. 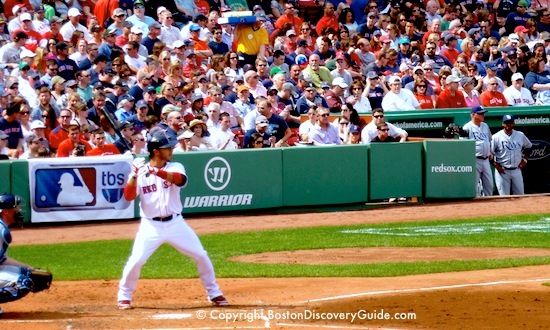 Boston Discovery Guide > Sports > Boston Red Sox Play in the World Series!